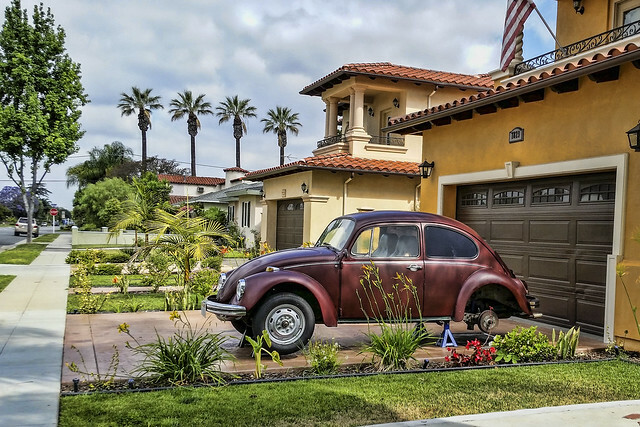 While it is not Herbie, this Beetle is a classic. I noticed it on a morning walk recently. Since I haven't posted about yard art in some time, and it appears to be semi-stationary, I decided this cute bug qualified as yard art. The Bug has quite a history. The Volkswagen Beetle, (aka the Volkswagen Bug), is a two-door, four-passenger, rear-engined economy car. Conceived by Hitler, designed and built by Porsche, the People's car was to get 40 mpg and cost around $250. Sounds almost too good to be true, right? While I have never owned one, it is one of those cars I have always liked and wished I had. It is small, but scores high on my "cuteness factor" scale. I might even consider one for a special decorative touch in my yard. Of course, I would probably have to have it filled with plants. Can't you just see the nasturtiums trailing out of the windows?